It might be hard to remember but back in the boom times of the last decade top chefs flocked to Las Vegas and gave the city a serious culinary facelift. Top French Chefs were well represented in the new blood with Ducasse, Robuchon, Savoy, and Gagnaire all present. MGM definitely scored a coup by luring Joel Robuchon out of retirement and giving Vegas its only 3-Michelin Star Restaurant. Not to be outdone, Ceasar's Palace opened Guy Savoy a few short months later under the management of Guy's son, Franck Savoy. 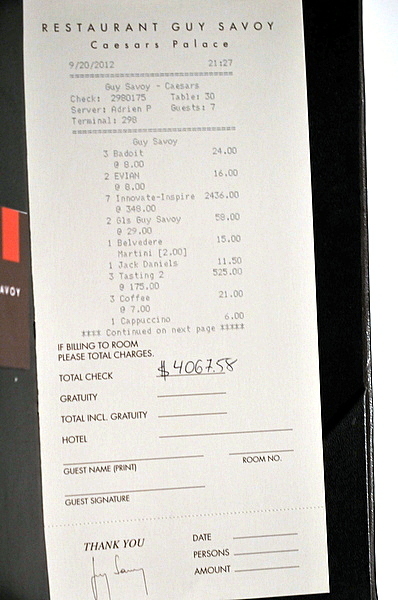 My first visit to Savoy was back in 2009 and at the time I thought it was top contender for Vegas' next 3-Michelin Star Restaurant. I've been meaning to come back for a while ad the addition of the Innovation-Inspiration pushed this to the top of my Vegas list. 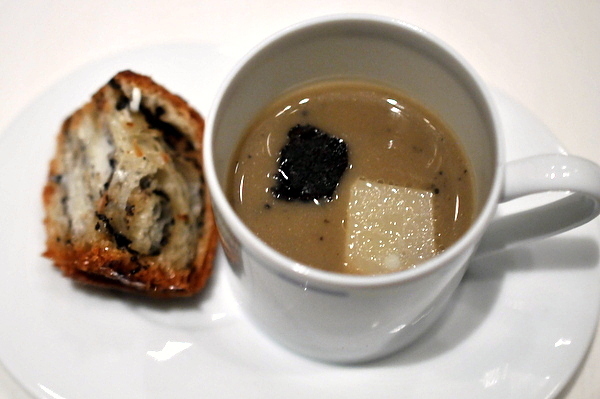 A fitting dish to open the meal, the simple simple terrine on toast is classically delicious while the black truffle adds the right touch of luxury to the bite. Some of my companions thought the foie was overly salty but I appreciated the extra savor. 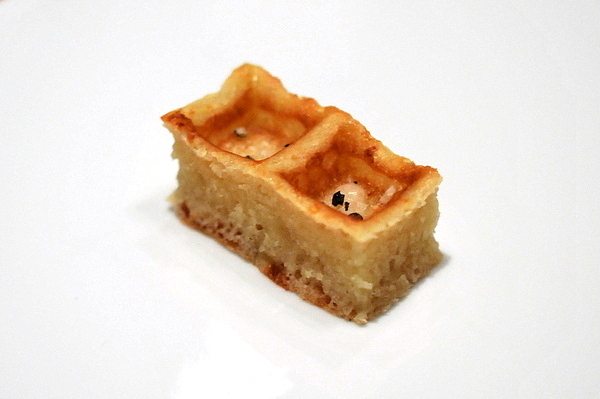 The waffle has a sweetness tempered by the Parmesan and black pepper, tasty but a bit ho-hum compared to the previous canape. 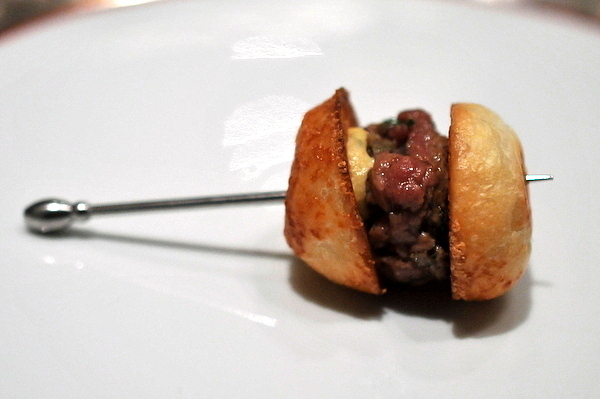 Just a simple combination of Parmesan, mustard, and a seasoned beef patty, but this little morsel definitely punches above its weight in terms of flavor and is easily one of my favorite sliders of all time. 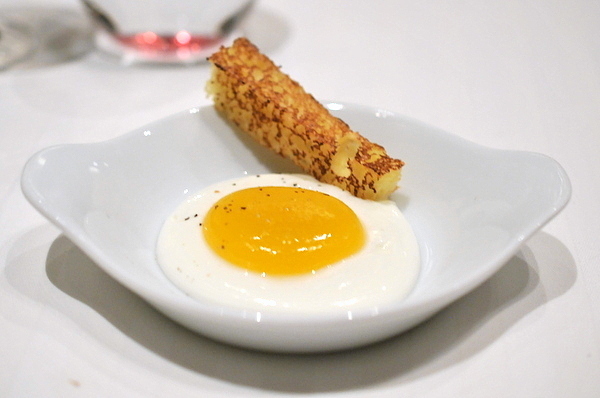 This is the dish that put Guy Savoy on the map and remains one of his signatures today. This sublime liquid has a silky thickness despite being water-based and the truffles come through forcefully when combined with the smoky slightly piquant artichokes. We were advised to dip the porous butter and truffle scented bread into the broth which adds a weighty sense of substance. Personally I found both elements delicious on their own, easily the equal of the combination. 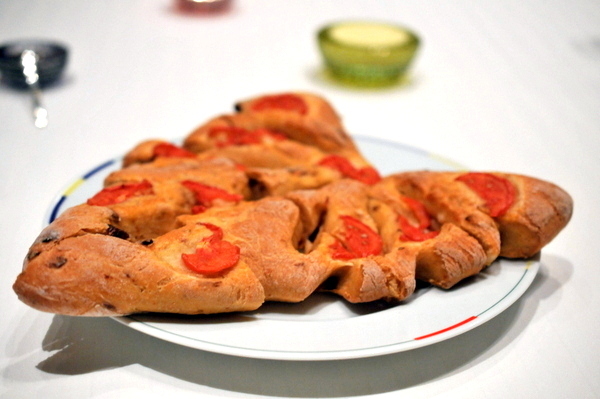 Fougasse is a Provençal bread typically shaped like an ear of wheat. The bread is dense and reminiscent of pizza dough and the subtle flavor of tomato only heightens the similarity. 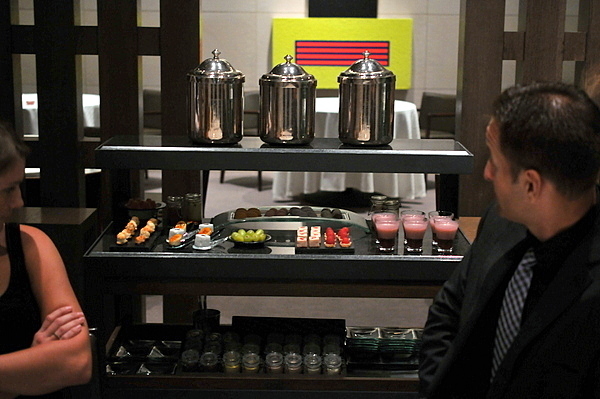 After the amuse and canapes were dispensed with one of our servers brought by a cart loaded with bread. 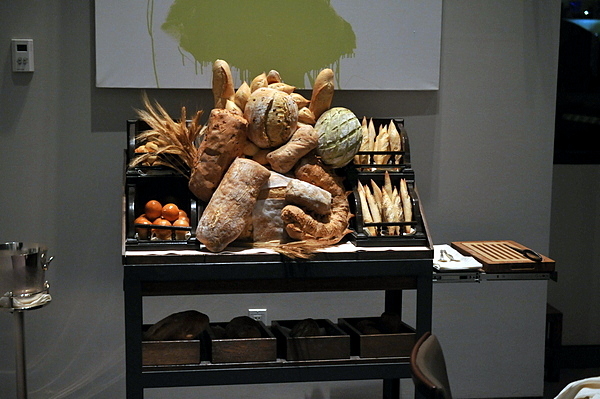 He proceeded to describe the various types and offer three choices for bread service: individual selections, a basket for the table, or a bread pairing which was the obvious choice. The canapes were so delicious that I didn't want them to stop coming, but thankfully the first official course was just as captivating. The coarsely chopped oyster gives off an aroma of fresh brine that is intensified by the seaweed while the granité provides both a bracing chill and a bright citrus kiss. With plenty of flint and lemon rind, results in a straightforward but effective mariage between the oysters and Sancerre. 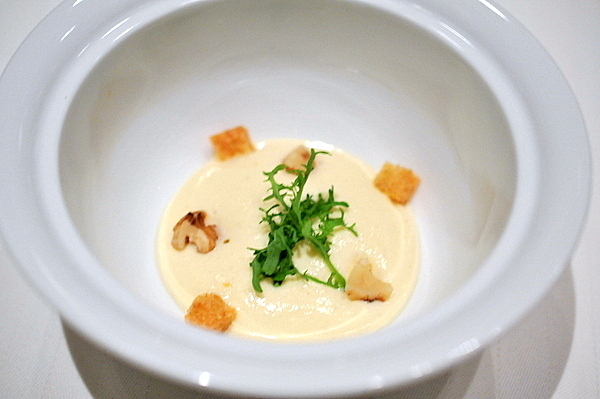 I really liked the image that the kitchen was trying to create with this dish. The pickled radish and espelette gelée certainly effectively created a sweet sour flavor though I didn't think it went that well with the shrimp. 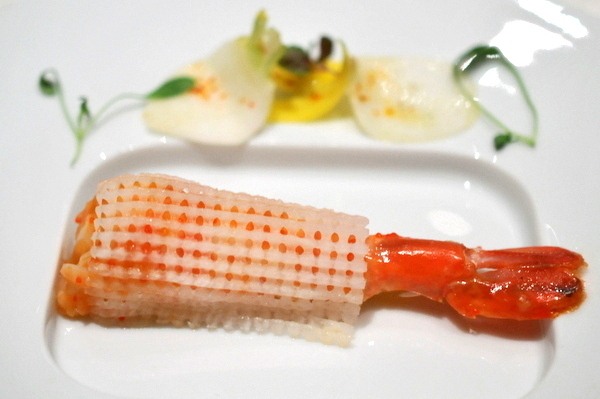 The prawn itself was a touch flabby and its natural flavor was lost beneath the "fishnet." The sake proved to be one of the night's more creative pairings, with a surprising viscosity and plenty of apple and melon fruit that had a sweet and sour verve of its own. 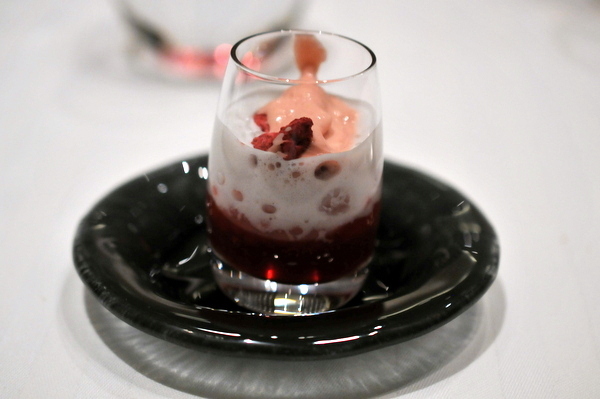 This course was my favorite of the night and is one of the most effective uses of caviar that I've ever tasted.. The potatoes are coated roasted in edible clay with squid ink giving it a gray speckled pattern. 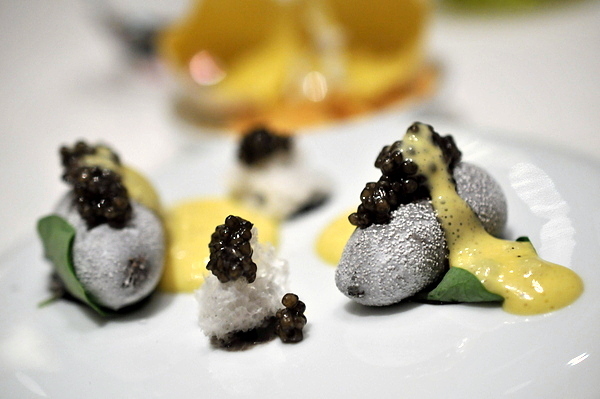 A dollop of salty caviar rests on each of the rocks which were then coated with the smoked sabayon. The potatoes are wonderfully starchy and their mild flavor effectively highlights the salinity of the caviar while the sabayon coats the mouth with a creamy smoke tinged silkiness. For those craving a bit more salt the dish also comes with slivers of salty fried potatoes though those were equally delicious on their own. We were given a glass of vintage champagne that definitely showed some body age in its full-bodied richness. 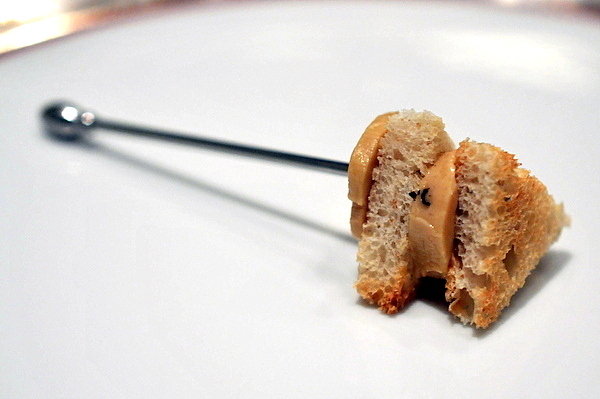 During my last meal the only tasting menu offered was the Guy Savoy Signature Menu. The courses were of course superb, but my one issue with it was the emphasis on reliving Savoy's greatest hits rather than continual innovation. The Innovation-Inspiration Menu remedies that with a continuously evolving menu that utilizes more avant-garde techniques and I thought this course exemplified that new philosophy most clearly. First we were given a sliver of raw salmon so we could get an idea of its texture. Next our servers placed slices of the raw fish on an extremely cold stone to freeze the fat. 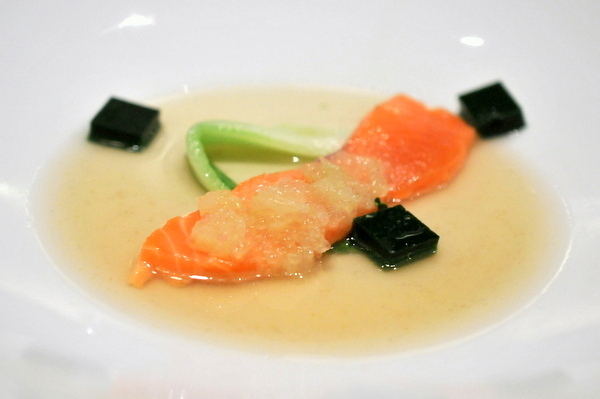 The frozen salmon was then transferred to a hot plate which to give it a texture reminiscent of cooked fish. Had I not seen the preparation with my own eyes I would have indeed taken this for cooked fish. 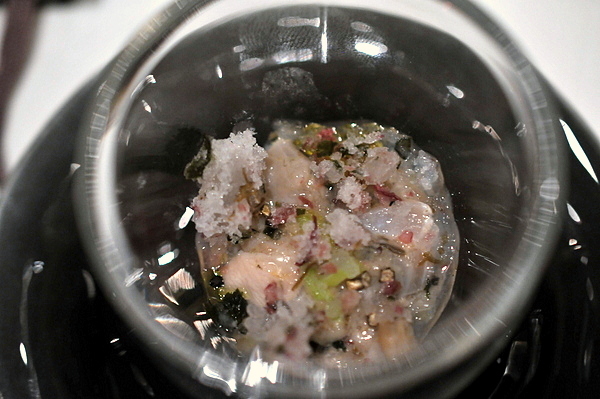 The accompaniments of finger lime and vegetables were delicate but well-calibrated to the fish. 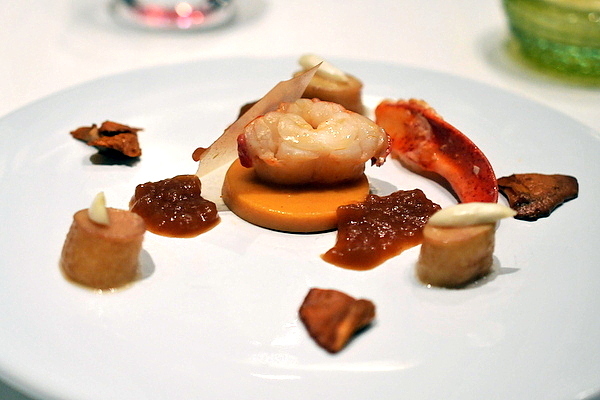 Looking at this dish on paper lobster and chanterelle is a classic combination, but I wasn't so sure about the peach. Indeed the mushroom and lobster were phenomenal; the lobster claw in particular was immensely flavorful and super tender. 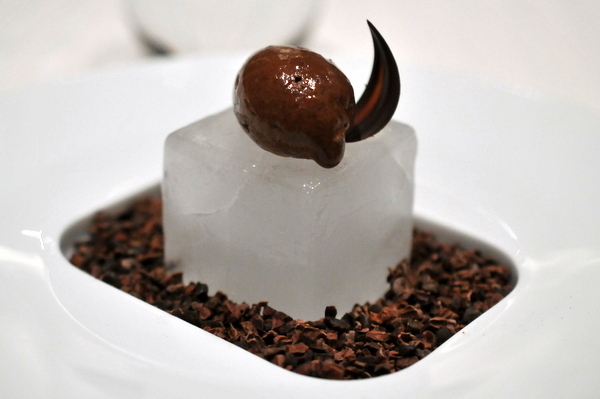 The lobster gelée is absolutely brimming with shellfish essence and the perfect boost for the succulent meat. The sweetness of the peaches was disconcerting in the context of the dish though I quite enjoyed them alone. My last time here was the first time that I'd tried foie gras with bitter accompaniments and at the time it was a touch overwhelming, but since then I've come to prefer it to sweet preparations. 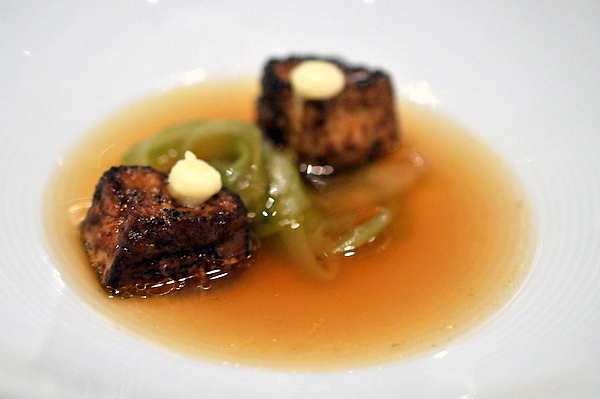 The cubes of foie are almost like eating rendered fat trapped in a thin shell. The tangy sting of the horseradish is absolutely brilliant in tandem with the foie. The celery has been cooked to a limp tenderness which also helped to leech out some of its flavor. An enchanting umami sensation ties the dish together which was especially impressive when you consider that it was made from "potato chips!" This was the only lackluster course of the night. I'm typically a huge fan of roast duck breast but the meat was inexplicably tough and the thick viscous carrot puree didn't help matters with a cloying flavor that obliterated everything else on the palate. To be fair there were some positives like the glassy crunch of the skin and the delicious caramelized sweetness of the tuille, but these weren't enough to overcome the dish's faults. The wine was a robust full-bodied CdP, with aromas of ripe red fruit, coffee, and pepper up front, on the palate I noticed vibrant plum and and figs tinged with herbs. Truly good Wagyu is one of those things that needs no embellishment. 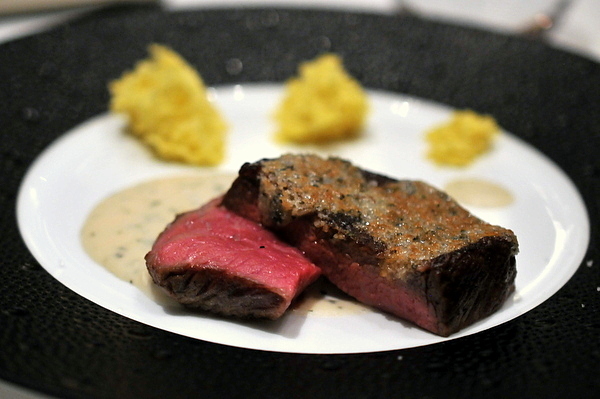 The beef looked to be about medium-rare and was immensely tender with fairly coarse marbling. The marjoram provides an herbaceous counterpoint to balance the gravitas of the meat, though there was a sharp piquancy that was a bit much. The Cannellini pureé was nicely nuttiness which worked with the meat but I didn't really see the need for the sponge cake. This was one of the most appealing cheese courses that I've had in a while. I've had Comté a number of times and considered the cheese tasty but a bit muted and overly firm. This ethereal mousse remedied all my concerns, airy and light, the whipped mousse settles across the tongue like a blanket amplifying the cheese's subdued flavor. At the same time the bitter contrast of the mustard greens and toasty crunch of the nuts and croutons are all readily apparent. Odd pairing a Chardonnay but it worked well with the cheese, lots of lemon zest on the attack but with a rising buttery oakiness on the midpalate and finish. Our first dessert consisted of Greek yogurt and mango puree with a French toast stick. I found the yogurt and mango a bit washed out and thin, but the wine more than made up for it with plenty of honeyed tropical fruit balanced with abundant acidity. The desserts are almost laughably simple in comparison to the savories but there is something refreshing about their directness after so many intricate savories. I ended up trying pretty much everything on the cart. 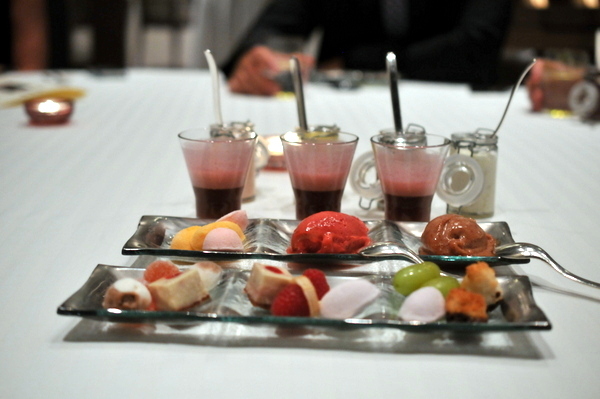 For me the standouts were the chocolate mousse, raspberry sorbet, and fresh grape soda. 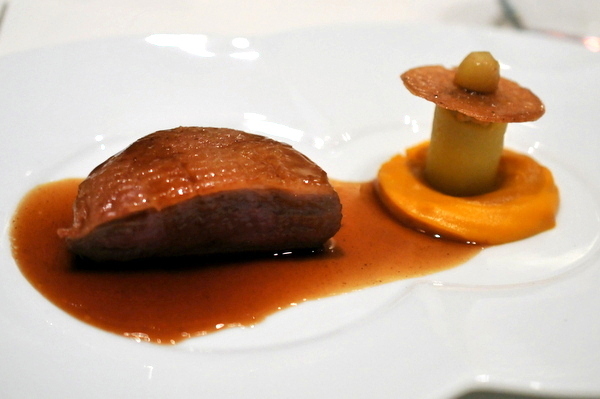 Though Guy Savoy still delivers a rarefied experience, the meal didn't quite measure up to my expectations. Service was on point and attentive, and the wine pairings were creative but the only new course that blew me away was the potato dish while both the lobster and sweet shrimp both gave me pause and the duck was a complete disappointment. That being said, the restaurant is worth a visit but I don't see it getting that third star anytime soon. Another epic meal and great review! Thanks! Stay tuned for more Vegas adventures.